The person who posted this recipe wrote: " I don’t do very well with alcohol and use it sparingly when cooking. But this recipe had to have some alcohol in it. It just had to." 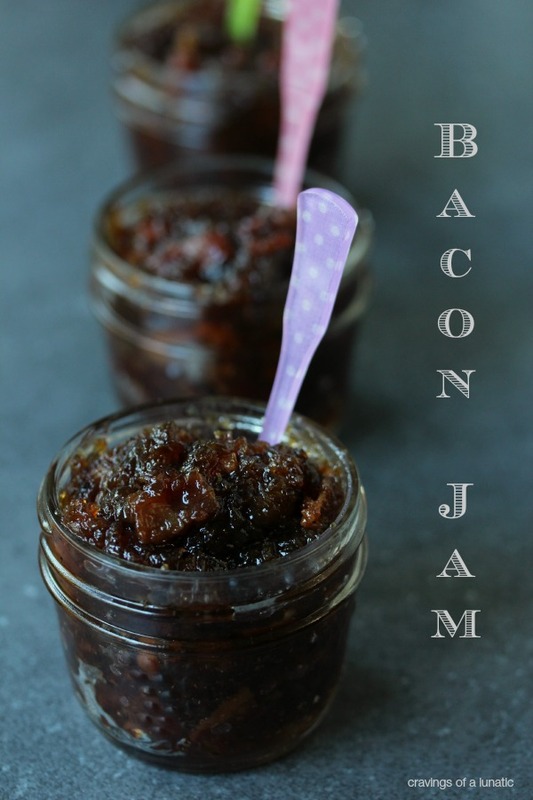 So here is a Bacon Jam with no coffee, using Bourbon instead. Cut mushrooms and finely chop onion, then press or chop the garlic cloves. Heat up a pan and sauté mushrooms, onion and garlic all together in 2 tablespoons Bertolli extra virgin olive oil until the mushroom starts to brown, and the onion is soft. Add 1/2 cup chicken stock, 1 1/2 cup cream and 2 tablespoons chopped fresh dill. Let the sauce simmer for a few minutes and season with salt and pepper. Cook up enough pasta for 4 people. Strain and place in a bowl, then mix in the sauce and serve with shaved parmesan on top. 1. In a small bowl, combine the raisins and whiskey. Set aside for 1 hour. 2. In a medium saucepan or pot, combine the rice, water, milk, cream, butter, and salt. Bring it to a gentle boil, then cover the pot, reduce it to low, and simmer for 20 to 25 minutes, stirring twice during this stage. Note: The rice should be cooked, but there should still be visible creamy liquid; it should not all be absorbed. If the liquid looks like it is absorbing more quickly than this, you can cut this stage to 18-20 minutes. 3. Remove the pot from the stove and add the sweetened condensed milk, cinnamon, nutmeg, and vanilla. Return to low heat for 5 minutes to finish cooking. 4. Remove the pot from the stove and slowly drizzle in the beaten egg, stirring constantly. Drain the raisins and stir them in. If you’d like the pudding to be a little creamier, stir in a little more sweetened condensed milk. If it’s too creamy, return to the stovetop and cook for another 3 to 4 minutes. Serve immediately in a small bowl. 1.Combine 1/2 cup butter, brown sugar, light corn syrup, and chopped pecans. 2.Heat up the mixture over medium-low heat, then allow to bubbly gently for 5 minutes, or until consistency is like a nice caramel sauce..
3.Remove from the heat and set aside. Gravy from the Thanksgiving turkey pan drippings. Remove the turkey from the roasting pan and set aside to rest. Leave the drippings from the turkey in the pan and place the roasting pan over medium heat. Add the broth and wine at the same time. Whisk to combine, scraping the bottom of the pan until all of the bits have come loose. Cook for another 2 to 3 minutes in order to reduce the mixture slightly. Transfer the liquid to a fat separator and let sit for 5 minutes to allow fat to separate. Return 2/3 to 3/4 cup of the fat to the roasting pan and place over medium-high heat. Discard any remaining fat. Add the flour and whisk to combine. Cook, whisking continuously, until the mixture starts to thicken and become smooth, approximately 2 to 3 minutes. Once this happens, gradually add the liquid back to the pan and whisk until smooth and you have reached your desired consistency, approximately 5 to 6 minutes. Remember, your gravy should be slightly thin in the pan as it will thicken once you serve it. Add the herbs and whisk to combine. Season with salt and pepper. Roast the turkey on lowest level of the oven at 500 degrees F. for 30 minutes. 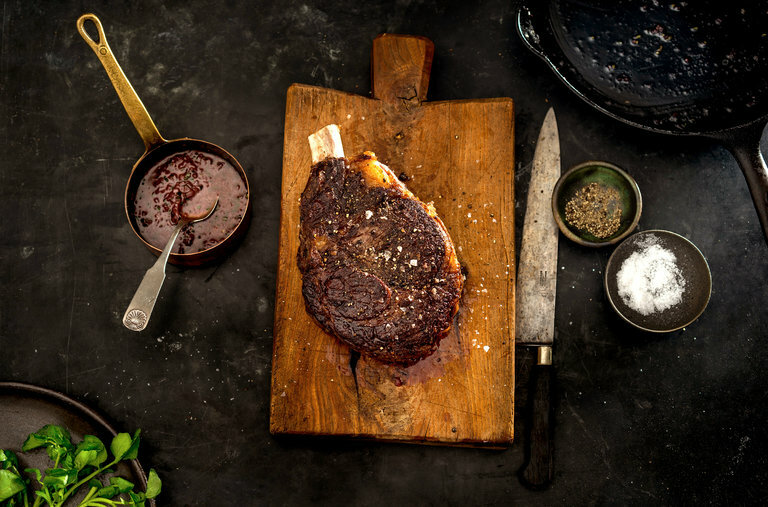 Insert a probe thermometer into thickest part of the breast and reduce the oven temperature to 350 degrees F. Set the thermometer alarm (if available) to 151 degrees F. A 14 to 16 pound bird should require a total of 2 to 2 1/2 hours of roasting. Let the turkey rest for at least 15 minutes before carving. Making homemade gravy is one of the most daunting challenges that a new cook can face. Getting the thickness right, making sure there are no lumps and not scorching it are all hurdles. Once you’ve leapt those, you still have to figure out how to season your gravy. The best time to do that is while it is beginning to thicken. But there are literally hundreds of spices to choose from and not every spice goes with every kind of gravy. Don’t panic. Choosing gravy spices is a snap once you know the basics. Season beef gravy with strong-flavored, savory herbs. Dried bay leaf, marjoram, sage and thyme add a rich depth to beef gravy. Grated nutmeg adds an unexpected grace note, and coarse pepper of any kind -- black, green, pink or white -- adds a tangy bite. Onion and garlic powder also work but these can easily overwhelm the other spices. Spice up chicken and turkey gravy with lighter savory spices. Premixed poultry seasoning is the simplest choice. It usually contains oregano, rosemary, sage, thyme and pepper. Adventurous cooks can also experiment with ginger, marjoram, paprika and tarragon. Lemon pepper adds a fresh bite to poultry gravy. Sprinkle generous amounts of strong-flavored spices into pork gravy to complement its richer flavor. Garlic and onion are best with pork, though these also complemented by oregano and sage. Use a light touch when seasoning fish gravies to avoid overwhelming the delicate taste of the main dish. Lemon juice is best unless your gravy is cream-based. To avoid curdling the cream, use lemon zest or dried lemon peel. Curry, dill and mustard go well with fish, as do marjoram and paprika. Season vegetable gravy according to the natural flavors of the produce in question. Strong, green vegetables like broccoli and kale can stand up to bold flavors like lemon, garlic and onion. More delicate vegetables like leeks and cauliflower do better with lighter curry, dill, cinnamon and parsley. Carrots and most squash are also complemented by cinnamon, allspice and other so-called baking spices. Never over-salt gravy because it not only overwhelms the other flavors, but too much sodium can contribute to high blood pressure. Always use a light hand when adding spices to gravy because you can always put more in, but you can’t take any out. Easy make ahead dripless apple cider gravy. A flavorful addition to all of your holiday meals! In a medium saucepan over medium heat, melt butter. When butter is fully melted, whisk in flour until thickened. Slowly add broth and cider, whisking well to combine. Season with salt and pepper. Bring to a low boil, continuing to whisk until desired thickness is reached. Serve immediately or chill and reheat as needed. If making ahead, press plastic wrap to the surface of the gravy to prevent a skin from forming. Reheat in a saucepan or in the microwave, stirring to ensure an even temperature. *Vegetable broth may be used in place of chicken broth for a vegetarian option. *If apple cider is not available, apple juice may be used instead. Homemade brown sugar barbecue sauce with a spicy kick. Put all the ingredients in a sauce pan over medium heat, stirring frequently until it begins to boil. Reduce to low heat and cook for another 2 minutes. Sauce can be used immediately or allowed to cool and put in an air tight container in the refrigerator. Add red pepper flakes for a little spice in addition to this sweet flavor. 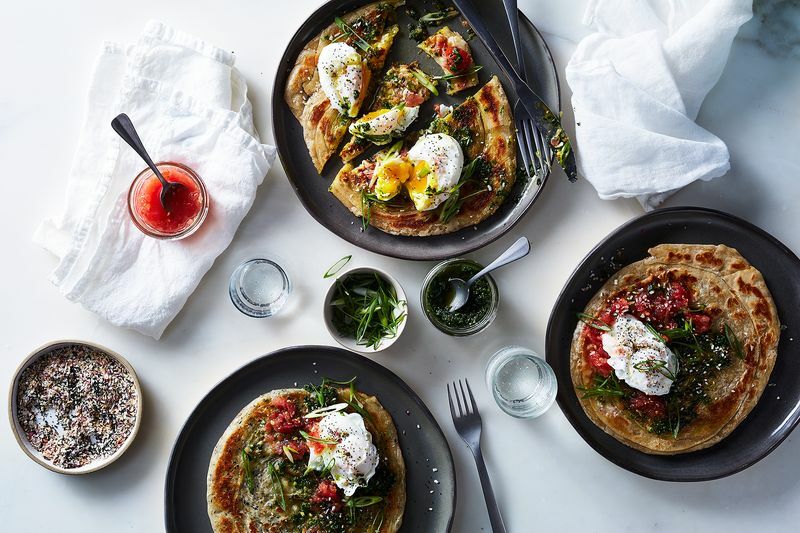 Flatbread that resembles a pancake and pulls apart like a croissant; irresistible, buttery, flaky flatbread. 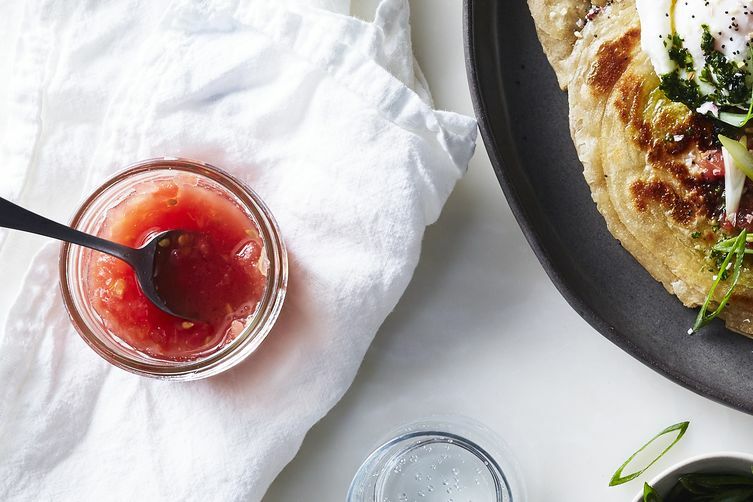 Commonly eaten for breakfast, served with a drizzle of honey or with hard boiled eggs, grated tomato**, and zhug (a Yemeni spicy herb sauce)* The dough is time consuming to prep, but make this recipe or double it, and store them in the freezer-- the pancakes can go straight from the freezer to the grill pan and be ready within 3 minutes. 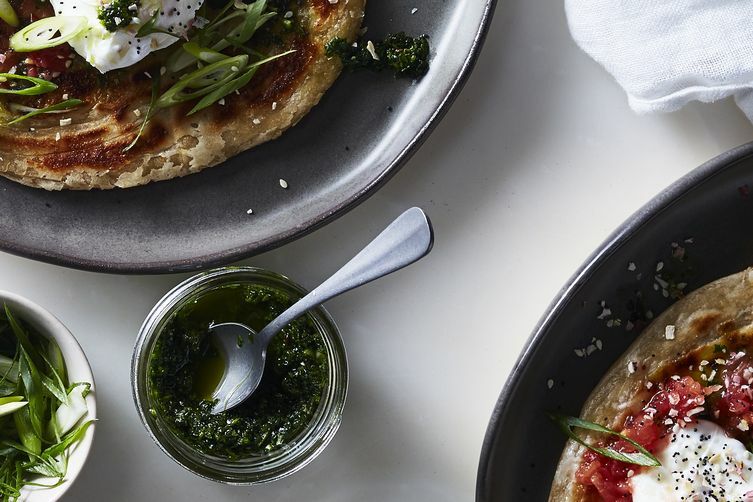 Think of this sauce as a fresh, fiery middle eastern pesto; perfect dolloped into soups, slathered in a sandwich, or my favorite-- on eggs. The general framework for this recipes includes fresh parsley and cilantro, pulsed with spices, and hot peppers. Experiment with your favorite pepper (Thai chiles, even) and add more depending on the heat you can handle. Make a batch now and use it throughout the week. This is a traditional condiment used in Mediterranean cuisine and is delicious served alongside eggs, with a favorite toasted bread, or on pasta as salsa cruda. "Pepper Steak" with "Port-Wine Mushroom Sauce"